Public lighting improves the safety, comfort and security of all road users, including cyclists. It is an essential requirement for urban commuting during winter months. Unlike motorised vehicles, bicycle headlamps will not illuminate the route. Their design purpose is primarily to alert other road users to the presence of the cyclist. Cyclists are dependent on ambient or public lighting to see where they are going. Under the 1993 Roads Act (Section 13, Part 2), local authorities are statutorily required to maintain public roads, including cycle ways and cycle tracks. 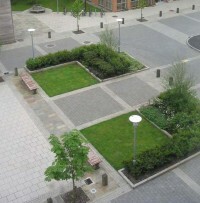 The provision and maintenance of public lighting facilities form part of this requirement. Public lighting should always be considered as part of the Road Design and Road Safety Audit processes. Well-designed public lighting increases the attractiveness of the route and gives the cyclist a greater sense of security. It can also increase the accessibility and utility of the route. Street lighting helps cyclists to see potential hazards such as street furniture, gullies, broken glass etc, but also to see other road users. The design, installation and maintenance of public lighting measures should be carried out in accordance with the Codes of Practice and reference guidelines listed below. Any proposed derivations should be subject to consultation with, and agreement by, the relevant Local Authority Public Lighting Department. This section provides detail design advice in relation to the appropriate selection of light fittings, lighting levels, the correct positioning of street lighting and ensuring the safety of users. The height of lighting column to be provided will depend on the type of road, e.g. whether it is a Distributor, Local Collector or Access road. Generally, bus routes and distributor or higher-order collector routes benefit from higher lighting columns, while residential areas benefit from lower lighting columns. The design speed is directly proportional to the stopping sight distance. Lighting in urban areas must allow a minimum cycling sight distance of between 20 metres to 40 metres, preferably towards the upper limit. This will cater for the majority of cyclists. Care should be taken to avoid creating an obstruction for cyclists or pedestrians when positioning lighting columns at the edge of the roadway. A minimum clearance of 0.5m between the lighting column and cycle lane or track is recommended. If there is no verge outside the footpath to locate the lighting column, the column should be located to the back of the footpath, and adjusted if necessary to deliver the lighting levels attributed to the carriageway. Public lighting columns should be relocated at an early stage in a retrofit project to allow for a smooth finish of pavements around the lighting column. Vertical clearance to allow for maintenance and other access requirements should be a minimum of 4.0 metres. In certain circumstances, e.g. for bridges and parapets, the use of deck, parapet or other non-column mounted lighting may be more appropriate. Care should be taken not to locate lighting columns close to tress that may obstruct the light. 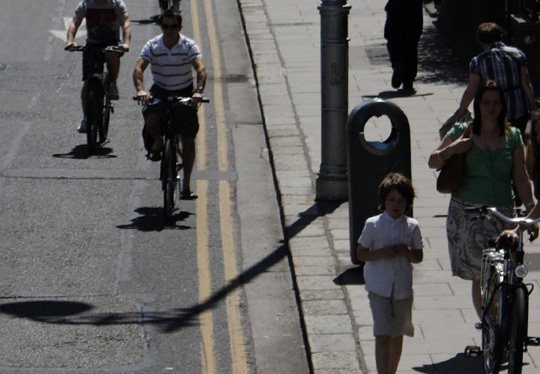 Street lighting should give enough light to enable all road users, including cyclists, to see each other, as well as objects on or next to the road, at a reasonable distance. The quality of light is improved by using brighter colours of road surface that reflect more light. Street lighting in urban areas should be sufficient to allow motorists to use dipped headlights. This will reduce the risk of cyclists being dazzled by full beam headlights. On major roads the lowest light intensity on the road surface should be at least 30% of the highest light intensity. On lower-order roads, a corresponding low-high ratio of 15-20% may be adopted. Further guidance is provided in the table below. Designers need also to be aware of possible light pollution in environmentally sensitive areas. Crossings must be well-lit to highlight pedestrians and cyclists both approaching and using the crossing if the general carriageway lighting is insufficient. Additional lighting at both sides of the crossing may be required to achieve this. Outside of built-up areas, recreational routes will not normally require lighting unless there are specific road safety concerns, e.g. at junctions or crossings. Underpasses require special attention to address a perceived sense of reduced personal safety for pedestrians and cyclists. Underpasses should be provided with a minimum level of 30 Lux unless a CCTV system requires a higher level.